The AHC’s Alan K. Simpson Institute for Western Politics and Leadership held a panel discussion of participants from the Black 14 incident that occurred at the University in 1969. The panel occurred on September 22, 2010 and is available for viewing online. The panel was conducted through the Wyoming Equality Network (WEN) video conferencing system. WEN is available in every high school in Wyoming, as well as at UW and in the state’s community colleges. 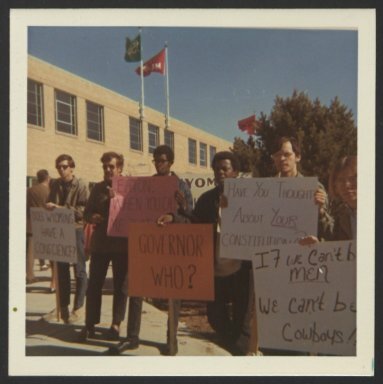 The incident that came to be known as the “Black 14” began on October 17, 1969, when 14 African-American players were dismissed from the University of Wyoming football team by then coach Lloyd Eaton. These players wanted to wear black armbands during an upcoming game with Brigham Young University to protest a policy of the Church of Jesus Christ of Latter-day Saints which they considered racist. BYU is operated by the LDS Church and the policy in question was one that did not permit African Americans to become priests (a policy that did not change until 1978). Coach Eaton’s actions and the University Board of Trustee’s decision to support him led to a unique case pitting the constitutional right of free speech against the principle of separation of church and state. During the WEN panel discussion schools from Afton, Casper, Dubois, Riverton and Wheatland asked questions of eyewitnesses and participants in the Black 14 incident, including Black 14 member Mel Hamilton, former UW student and campus activist Kathy Karpan, former Branding Iron editor Phil White, former UW Athletic Assistant Kevin McKinney, and College of Law Professor Jerry Parkinson. The enthusiasm and curiosity of the students were remarkable. The AHC had already digitized primary source documents about the Black 14 incident and created a lesson plan, all of which were distributed free on CDs to middle and high school classrooms in Wyoming as part of the AHC’s “Teaching with Primary Resources” series, partially funded by a U.S. Department of Education grant. The panel discussion allowed the teachers to integrate the student question-and-answer session with AHC resources. All of the digitized material used for the “Teaching with Primary Sources” series were derived from three AHC collections, all of which are now available for viewing online: Branding Iron (Laramie, Wyo.) Records, the Irene L. Kuttunen Schubert Black 14 Collection, and the University of Wyoming President’s Office Records. This was the first time the Simpson Institute employed WEN to reach out to the state’s public school students and teachers. The success of this effort encouraged us to continue using this outreach tool. Look for more WEN offerings in the future! This entry was posted in African American history, events, outreach, University of Wyoming, Wyoming history. Bookmark the permalink.